Rhys Ruddock and Ireland his team-mates are braced for “horrible” conditions ahead of Saturday’s clash with Japan in Shizuoka. Joe Schmidt’s squad arrived from Tokyo by bullet train on Thursday and trained in 30-degree heat at Ecopa Stadium during their captain’s run on Friday. The game kicks off at 2pm local time (6am BST) with the temperature set to soar into the 30s once again. The Brave Blossoms will look to inject a furious tempo into the contest straight from the kick-off - spearheaded by scrum-half Fumiaki Tanaka, who had a three-year stint with the Otago Highlanders before moving to the Sunwolves, Japan’s flagship Super Rugby side. “I would imagine it is going to be a serious challenge,” said stand-in skipper Ruddock. Ruddock will be joined in the back row by Leinster team-mates Jack Conan and Dan Leavy, who replaces Josh van der Flier at openside flanker. Van der Flier started the 55-19 victory over the US Eagles but drops out of the matchday 23, with Munster flanker Jack O’Donoghue providing explosive impact from the bench. 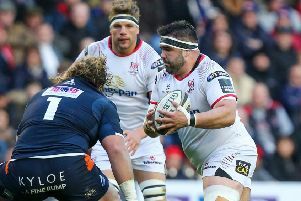 The Irish trio will have their hands full against Japan’s powerful back row of Waikato Chiefs flanker Michael Leitch, Melbourne Rebels number eight Amanaki Mafi and promising Sunwolves openside Yoshitaka Tokunaga. “We’d have known a lot about Leitch and Mafi from over the years playing for Japan and the performances they’ve had along with their performances in Super Rugby” noted Ruddock. “But the seven as well - Tokunaga - he’s a player we would have seen a little less of until this tour and he’s really impressed us. “I think for us as a back row, contending with him could be our biggest challenge. He’s dynamic and he’s really good around the breakdown and he’s quick. He could pose a lot of problems for us. Japan head coach Jamie Joseph has selected an exciting backline, with Tanaka and fly-half Yu Tamura linking up in the half-back positions. Ireland’s midfield of debutant Munster centre Rory Scannell and Leinster star Garry Ringrose are sure to be tested by Japan’s heavyweight pairing of Timothy Lafaele and rugby league convert William Tupou, who represented the North Queensland Cowboys in Australia’s NRL. “They’re a really strong side,” added Ruddock. “We actually know a lot about their players. The work we’ve done in the week has allowed us to know what their strengths are but just to name a few: guys like Tanaka and Tamura are quality operators. “Even Lafaele as well, he’s got a strong passing game. He’s probably someone that we wouldn’t have come up against a lot, a 12 that has the ability to play with such awareness of other players. He’s also a 10 I suppose so he has that passing.